GIGABYTE Tech Daily: Don't Miss Out on Your Chance to Go to Blizzcon! 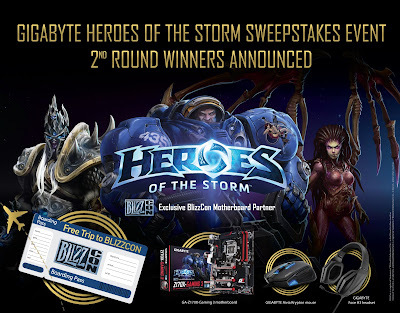 As you might remember, we recently announced the Grand Prize Winners of the GIGABYTE Heroes of the Storm™ Sweepstakes as well as the 2nd Round of Winners for GIGABYTE Prizes. There are some great prizes on the list, which include GIGABYTE motherboards and a trip to Blizzcon in California! We sent out an email to winners recently, but sometimes these get stuck in spam filters and won't make it to your inbox. You can check the full list of winners here. If you won the Grand Prize of a free trip to Blizzcon we'll need to hear back from you ASAP! Don't lose your chance to go to Blizzcon!